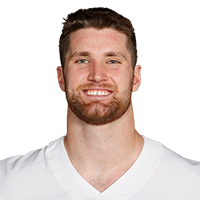 Analysis: A 2018 fourth-round pick, Schultz caught 12 passes for 116 yards in 11 games during his rookie season while sharing snaps with Jarwin, Geoff Swaim and Rico Gathers. The Cowboys allowed Swaim to leave for Jacksonville, but the majority of his 512 snaps from 2018 likely will be filled by Witten, who reportedly is ticketed for about 25 plays per game. It will be difficult for any one player to emerge from the committee with fantasy relevance, and Witten would probably be the best bet to do so. Analysis: The fourth-round pick out of Stanford didn't produce many highlights as a rookie, with modest single-game highs of three catches and 37 yards. Blake Jarwin's emergence late in the season will give Schultz an uphill climb in camp next summer if he wants to win the Cowboys' starting tight end spot even if he shows significant development, but with Geoff Swaim a free agent, there could still be plenty of snaps available for Schultz as the team's No. 2 TE. Analysis: While the rookie's snap count has been boosted since Geoff Swaim (wrist) got hurt, Schultz hasn't started seeing regular looks from Dak Prescott until the last couple of weeks. Blake Jarwin has emerged as the team's primary pass catcher at tight end, however, putting a significant damper on Schultz's fantasy potential. 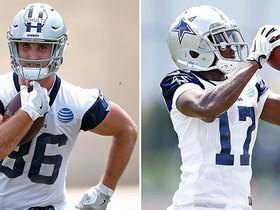 NFL Network's Jane Slater reports from Dallas Cowboys training camp on their new receiving core, and who they expect to step up in the absence of the departed Dez Bryant and retired Jason Witten.